Eco Bee Box is a hive for those that want a superior hive with no fuss. Painting is obsolete. Panels can be replaced if needed. Comes in various sizes and can be adapted to suit the needs of the beekeeper. Comb boxes aim to save $ on extracting time, equipment and mess. 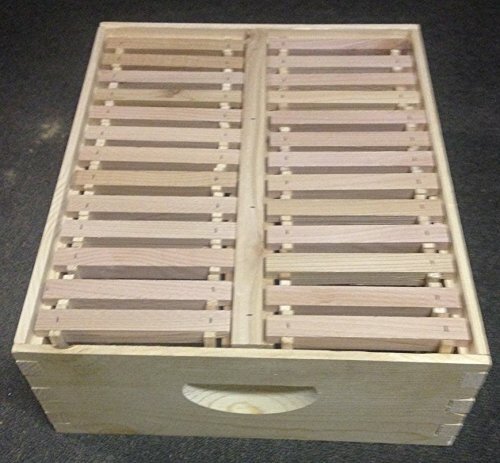 Cedar comb box with foundation-less frames. No paints needed for woodenware. Can't crack or warp. Cut comb out, place into baggy, seal and squish. Let set over night. Pop hole in baggy and squish out like icing. Manufacturer: Eco Bee Box LLC. Publisher: Eco Bee Box LLC. Studio: Eco Bee Box LLC. If you have any questions about this product by Eco Bee Box Utah Hive Full, contact us by completing and submitting the form below. If you are looking for a specif part number, please include it with your message.